Sunnyland Elementary fourth grade teacher Brian Pahl maintains a classroom blog titled Be Good Humans. 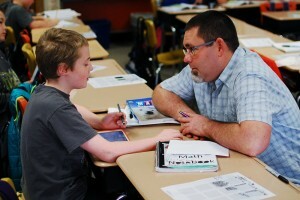 The blog’s name gives some insight into the type of teacher – and person – Pahl is. And the fact that he’s created a classroom blog hints at something else about Pahl: His desire to weave technology more tightly into his teaching practice and the importance he places on doing so. Just a few of the ways Pahl and his students use technology in their classroom curriculum include producing digital stories on the aforementioned blog, creating book trailers, and individually recording math tutorials, which are then used in the classroom and by Pahl in evaluating and helping his students succeed. During a recent visit to Room 12, Pahl and his students break into small groups to work on several different projects – in several different ways. 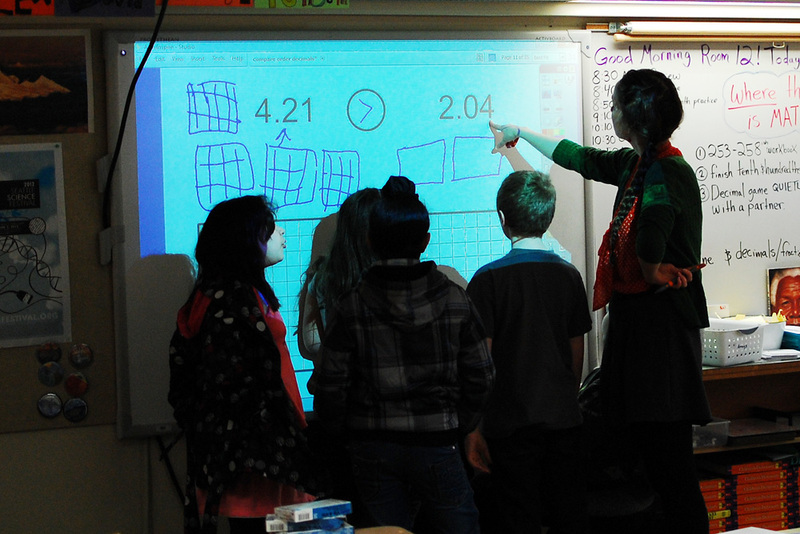 A few work together on math problems in a sun-filled corner of the room, while others work with student teacher Ms. Binderup at the front on a SMART Board (think white board married with an old-school overhead projector, that responds to touch). Some students study workbooks at their desks, pencils in hand. At the back of the room, a handful of students type away on laptop computers, one girl balancing on an exercise ball while she works. 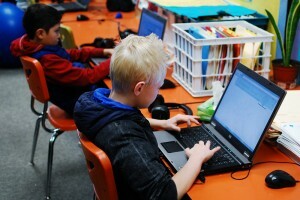 Two students use math games to study math facts, while one adds photos to his “space glog” – an online multimedia poster each child is creating with Glogster software. Out in the hallway, a group of five students sits at a small table with Mr. Pahl. Each has an iPad or iPad Mini in hand. Pahl explains the activity and sends the children off to explore. They walk around the corner with their iPads in search of angles to photograph – one 90-degree angle, one angle less than 90 degrees, and one greater than. Pahl helps gently guide them from time to time as they search. When the group reconvenes at the table, they then use an app to write directly on their photographs with a stylus pen, labeling the angles they’ve found. Part of the group then begins to work on number line problems, again writing directly on their iPad screens with a stylus. 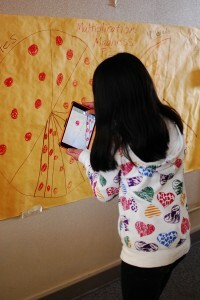 Two students, Miranda and Tim, separate from the group and find quiet corners in the hallway to record themselves on their iPads as they work through fraction subtraction and addition problems. Sure, the same thing could be done on paper or on the white board – who among us doesn’t remember standing in front of the class, chalk in hand, showing how we worked through a problem step-by-step? 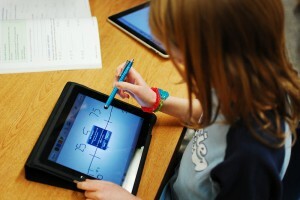 – but the novelty of recording it on the iPad, and then playing it back for classmates, ups the engagement factor. Another benefit to often recording the work is that it gives Pahl a breakdown of each student’s process – he can listen to them narrate each step – and any stumbling blocks – as they work through a problem. We move back into the classroom and students swap activities. Pahl pulls up a screen on an iPad to show me a myriad of student-created math tutorials. He kneels down at the desk of a boy working on an iPad who is struggling to place a specific decimal point on a number line. Their conversation is recorded as the student talks through the problem with encouragement from Pahl. It’s a slow process and Pahl is patient, guiding the student slightly, but mostly sitting back and letting the boy persevere as he talks his way through the problem. After focusing for several minutes, the student lands on the correct answer. Pahl’s use of technology in the classroom is meant to engage his students further, but also to prepare them for their futures. Watch this video made by Pahl, which he has entered into the PBS LearningMedia Digital Innovator Contest. If selected, he would participate in a year-long professional development program designed to foster and grow a community of digitally savvy educators, as well as receive national recognition and membership into a robust professional learning community. The top 15 applicants will receive an all-expense paid trip to Washington, D.C., to participate in the 2014 PBS LearningMedia Digital Summit.